For decades Erie City Code Enforcement has operated by way of a system that protected the friends of political bosses while allowing code enforcement officers the culpable deniability necessary to operate in a city that was eroding by way of flight and blight. The city's population has declined by roughly 10,000 people during the past three decades and poverty levels are now near 30 percent. Urban sprawl and waning employment opportunities in the city also led to a dearth of single family homes and owner-occupied rentals. When that happens, old homes receive little attention bringing distress and blight to a critical mass. It's a familiar narrative in small and mid-sized communities across the United States. For the people who stay, by way of necessity or desire, addressing the structural problems that surround them as they work to face the age and state of their personal property can become a daunting task. Neighborhood organizations, corporate goodwill, and municipal awareness are often not enough, even in concert with one another, to offset incipient decline in even the best neighborhoods. That's why the role of code enforcement is so important. At its finest, code enforcement should be collaborative, rather than punitive; and it should reflect defined community standards. Our city code enforcement has traditionally operated as a complaint-based system, which means that someone sees something that doesn't look right — from minor issues such as tall grass and loose garbage not in proper receptacles, to major structural issues like crumbling facades or missing windows and doors — and submits a complaint. For anyone who has filed a complaint or bemoaned the physical state of the city to an elected official, complaint-based code enforcement might well be seen as being part of the problem. In many cases, there was limited response to problems — such as posting clean up notices with little additional follow-up, and little or no feedback to those who made the complaint to identify what had been done or was expected to be done. Lack of communication with the complainant may ultimately prove to be the greater of two evils. Had you asked city council members why blight and near-blight went unaddressed, the answer for them was simple. "That's not the way our system works," they would say. "We have a complaint-based system," they would continue. "There's no mechanism for active code enforcement," they would conclude. When I walked East Avenue with Councilman Bob Merski in 2015, his reaction to my questions about uniform codes and active code enforcement were almost Pavlovian. "That's not how we do it" was the general theme of our conversation related to code enforcement. To suggest that the caretakers of this fair city effectively change that code to create a system of active code enforcement was, then, beyond the pale. But now they have changed that protocol and city residents — mostly single family residential homeowners — are outraged. They're outraged because, after years of trying to maintain their properties and retain some financial value within a city in decline, they have become the target of active code "sweeps" taking place across targeted areas in downtown Erie under the auspices of the city's comprehensive plan, Erie Refocused. As Alayna Getchell ably articulated in this publication last issue, the implementation of that plan appears to be losing focus. Getchell is a lead organizer of a large group of concerned citizens that packed Erie City Council chambers on Aug. 16. More than 100 citizens attended that meeting and nearly a third spoke in defense of themselves and others during public comment. Of those who spoke, most were single family homeowners who feel they have become the target of a plan that was intended to make their lives better and their property more valuable. Most of the people who spoke at the Aug. 16 meeting were of modest means, living in houses that were built as long as a century ago. Houses like these require constant attention. One homeowner explained to council, as she had explained to the code enforcement officer, that she keeps a budget for home repairs, completing upkeep and repair based on cost and importance. It was a prudent and fiscally responsible explanation, but it wasn't enough to keep her from receiving notice that railings and paint on her porch were not up to code. A lower west side resident asked council to explain why she had been issued a repair order for chipped paint while the multi-unit rental next door with exposed soffits, missing windows, and overgrown shrubbery went uncited. "I have to live next to that," she exclaimed. "Why is he exempt?" Council has chosen not to engage those making public comment and, in doing so, it has dared not to provide an answer. 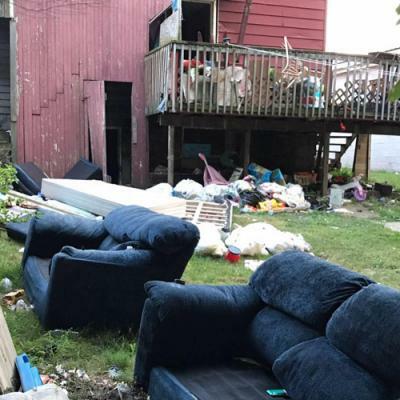 These residential homeowners once believed that the code enforcement sweeps recommended in Erie Refocused would target the absentee landlords whose dilapidated properties have become the portrait of blight in the City of Erie. They once believed that the code enforcement sweeps would force transient tenants, and the landlords who rent to them, to properly dispose of the couches, clothing, and garbage that are too often discarded in plain view of neighbors and the general public. And they once believed that code enforcement would curb the foot traffic at neighborhood "drug bars" (a.k.a. nuisance bars) by monitoring and, when necessary, shutting down repeat offenders. Once hopeful that they would be beneficiaries of such progress, these homeowners now perceive themselves as being part of the problem. Most are happy to comply and code enforcement is giving them the opportunity to do so. But addressing these minor infractions is the least of the concerns for the future of these residents or the future of this program. Many of these property owners simply want to be made aware of what's happening in their neighborhood, their shared public-private domain. To date that has not happened. Outgoing city councilman David Brennan acknowledged that lack of communication between city hall and the people of this city in a Facebook post following the meeting. "Notice to the public regarding the sweeps or any other implementation of the comprehensive plan NEEDS to be communicated and explained to the public before work starts! This communication can easily be done through press releases (as I have seen done in other cities), posting on the City of Erie website, or preferably meeting with neighborhood residents at neighborhood association meetings or other public informational meetings," he concludes. Mr. Brennan, like his colleague, Bob Merski, who derided the public for not attending other public meetings in city council chambers, continues to place the primary burden for the dissemination of information upon the citizen. Never mind the fact that an announcement online or in the public notice section of the daily newspaper is hardly an invitation to the average citizen to participate or to be heard. At best, it is the minimum legal requirement of a bureaucracy that prefers to operate without the collective voice of one hundred concerned citizens on a Wednesday night in August. The directive laid out to city leaders by Charles Buki and his associates, the authors of Erie Refocused, was to start and maintain a conversation with the people who lived in the neighborhoods where the change would soon take place. Establish rapport, earn trust, and gain their consent in this process. To date, rapport, trust, and consent are in short supply. Apparently, that's just the way our system works.